There’s an awful lot of hubris on display in the title of this book, which bills itself as The Autobiography of Jack the Ripper himself, and I suppose it was that hubris which caused me to seek out a review copy. Certainly, it wasn’t because of the subject matter, although I am in a minority in this: Jack the Ripper, the mysterious figure who in 1888 killed (arguably) five women in the Whitecapel part of London, entered almost immediately into the popular imagination, and his stature there has only grown larger in the 100+ years that have passed. There is a staggering amount of attention given over to Jack the Ripper. Books upon books on him come out every year. People who are experts on him are “Ripperologists,” apparently. My interest in Jack the Ripper is very passing: where it exists at all, it’s first because of my endless reading and fascination with the 19th century and everything in it, and second, because like other cases (such as the Halifax Slasher, a very interesting thing to read about indeed) I am interested in the social situation and reaction surrounding the Ripper killings. The actual killer, and the killings themselves, I am barely interested in. As Alan Moore (author of the staggering Jack the Ripper book From Hell) said, he was never interested in whodunit but whydunit, and I agree with that entirely. Likewise, this book is also barely interested in the Ripper or the killings, and that actually works out in its favor. The life of James Carnac as detailed in this book is a fascinating and riveting tale about which I don’t want to say too much and spoil things. I suppose you ultimately know where the story’s heading if you have even the vaguest familiarity with Jack the Ripper, but it’s about the journey rather than the destination. We follow James Carnac as a child, then a young man, then a man out on his own trying to make it in the world. We encounter his familial tragedies and difficulties with love, and generally follow along through his life. It would seem mundane enough, except that autobiography or a work of fiction, either way it is a very well-written and compelling book. There is a menacing line running through the book as Carnac’s fascination with blood (and with throats) builds and becomes something of a fixation. We know, ultimately, where this is going. The odd thing is that the book fails entirely as an autobiography of Jack the Ripper himself. Declaring it an autobiography sets up the expectation that the book, being a firsthand account, will provide you with details of the life and crimes of this man about which you had not previously known. That it will give you a glimpse into the troubled mind that carried out these crimes. However, when it comes down to the actual killing, the actual events of Jack the Ripper that we know about, the book is surprisingly vague. The killings themselves rate only a handful of pages, and even in those pages, they merit the faintest and barest of descriptions. Only a paragraph, or maybe two at the most. The women themselves are blank slates, victims waiting to happen. The killings are dismissed as quickly as possible. As I said, it’s vague about Ripper-business. And that’s fine by me, because where I think the book succeeds is as the life-and-times of a disturbed young man growing up in 1800s’ England. 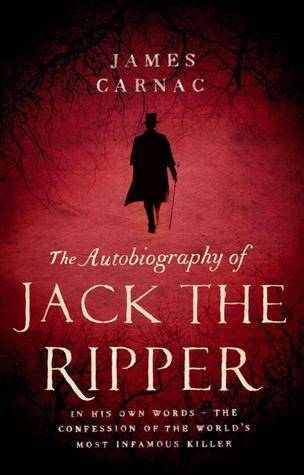 The actual biographical narrative of his life was, I felt, a riveting and enjoyable story which I wish had carried on unfolding without, as the end, dovetailing into the bare details we know about Jack the Ripper and his crimes. The story bogs down briefly with Ripper-killing, but the rest of the book is terrific. My decision lies firmly with ‘novel,’ and if it’s not extraordinary, then it is at least very compelling. But given that I don’t know that much about Jack the Ripper, and the book presented me with no information I didn’t know, I feel it’s a novel that is a bit vague about its own subject matter.